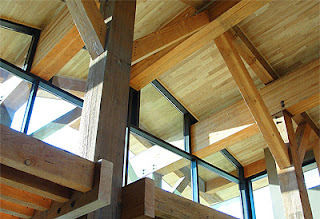 CATALYST ARCHITECTURE | Design_By_Place: What is a "Net-Zero" Energy Building? In most cases, Net-Zero Energy buildings are designed to consume as absolutely little energy as practicable from the start. All possible no-cost 'passive' strategies for energy-savings are explored first. Concepts such as optimized building orientation; properly placed, sized, and specified windows; natural daylight and ventilation opportunities; the incorporation of thermal mass, etc. are all low-to-no cost green buildings concepts. Once these low-cost ideas have been incorporated, then more sophisticated strategies can be considered. Energy-saving options such as higher-performing insulation products, better quality double (or even triple) glazed window systems, heat and electricity-saving lighting components, high-performance heating and cooling systems, as well as light shelves and other architecturally-based solar management strategies can all be evaluated for their life-cycle cost/benefit applicability.Finally, when all of these energy-saving options have been incorporated (or rejected) into the building's design, then and only then is the total net energy load for the building modeled and calculated, and a corresponding renewable energy system (typically solar photovoltaics) engineered to meet the remaining net electrical and power load requirements of the building. My company, Catalyst Architecture, is proud to have designed what we expect will be the 22nd Net-Zero Energy facility in the US - the 17,000-square-foot San Luis National Wildlife Refuge Visitor Center  located in the central valley of California. Despite the oppressively hot climate of the central valley, we were able to design this facility as Net-Zero Energy structure utilizing a 55 kW photovoltaic array. Not too bad for a building of its size. This building is also expected to achieve a LEED-Platinum rating - the highest rating possible from the US Green Building Council. It is already recognized as the highest-performing facility in the US Fish and Wildlife Service.